During the waiting time, voluminous amounts of CAD modelling were carried out as we continued to refine and improve the design, and we have cut two full-size portal frame sections. The assembly of these is now allowing Danny Squires to physically prototype the cladding and insulation systems at full size, to ensure our innovative environmental design ideas are realised. Watch out for more on this in the next newsletter! 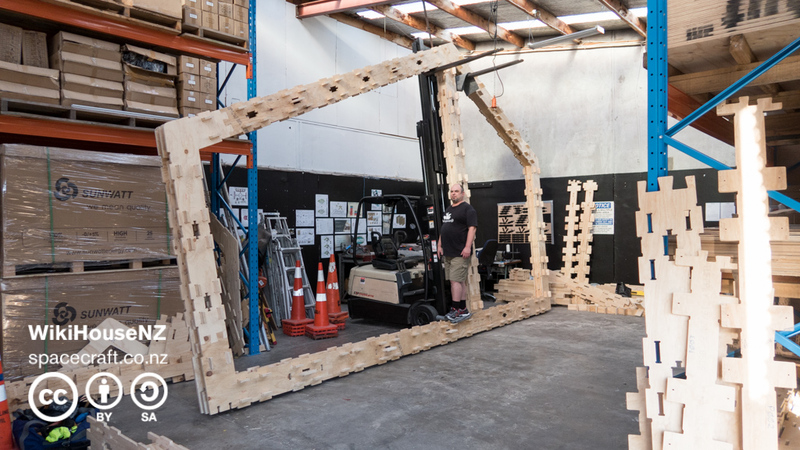 The full-size building pieces were cut at Inline Furniture Design in Aranui, where we also experienced a few delays because the brand-new machine used for the task needed considerable work to commission and calibrate. The good news is that the cutter now seems to be cutting consistently and accurately – generally to within a tenth of a millimetre, which is a much greater accuracy than standard in the building industry. 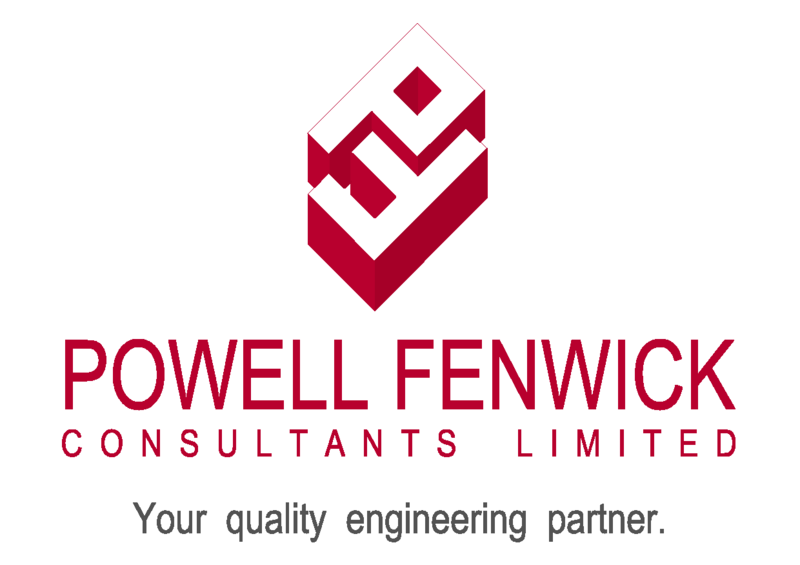 Thanks to the generous support of consulting engineers Powell Fenwick, one of our Wikiteers, Darren Kho, has been able to spend an average 8-12hrs a week working alongside three of their engineers. The access to peer review along with all their structural modelling software has proved invaluable in assessing the likely performance of our designs. Martin Luff and Rachel Wood have been focussed on refining and testing the design iterations of the main structure. This has allowed us to undertake extensive calculations on how the structural frame stands up to both permanent and imposed loads. The permanent load is the weight of the building itself – the structure, cladding and everything else – and the imposed load is what gets added, like your grand piano in the lounge or library of books or loads during maintenance. On top of that, the other main loads are dynamic ones such as snow, wind and seismic (earthquake) loading. Of highest concern is wind loading, which might surprise some people expecting that seismic loading would be top of the list, especially given the ferocity of some of the quakes Christchurch has recently experienced. However, on a day-to-day basis, a violent storm with loads of snow is more likely to destroy a building. Because the planned WikiHouse is an exciting shape, with slightly sloping walls and a steep north-facing roof, we have had to do extra calculations in regard to wind loading. The steeper the roof pitch and the apex, the more there are low-pressure areas that form around the apex and the eaves. The difficulty with wind loading is that while it pushes really hard on one side of the building, there is also a corresponding negative or a lower-pressure area on the other side creating a suction (or pulling) effect on the building. Corners are critical for structural strength, and because the WikiHouse design has taken the joints away from the corners, it is crucial to determine the stresses here. We theorised that by taking the joint away from the weakest place in the building, that is, where the main wall elements meet the floor or the roof, the structure will be considerably stronger. Therefore we've designed our own system to transfer the load around those corners. This has been achieved over several iterations developed from our original initial proof of concept model, making our transfer plate different from anything we've seen anywhere else. Other developments include working to eliminate the central supporting columns within the portal; providing greater adaptability for internal design layouts. This makes the whole building lighter, with lower mass and less foundation requirements. Secondly, it becomes easier and safer for ordinary people to assemble the building. As the portals get lighter, they are easier to handle - it also means less cutting time (cost) and fewer materials. 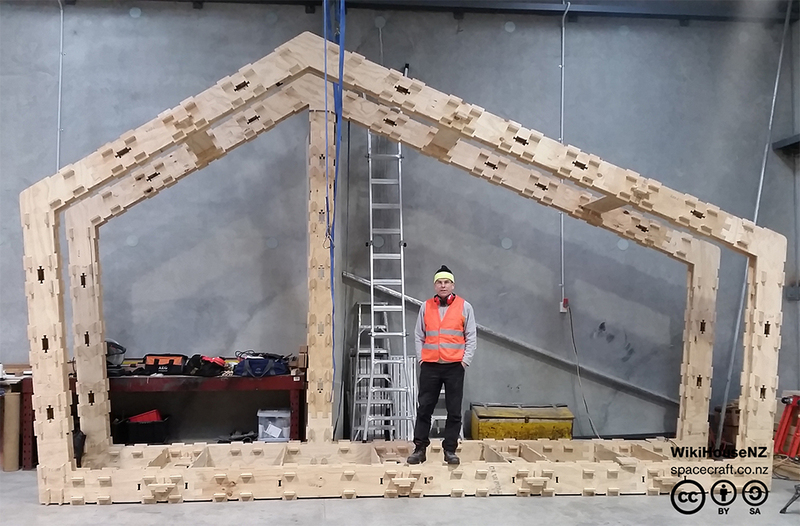 Although we still have further testing to complete, the initial house could have a clear span of 6.4 metres, by far the longest span achieved by any WikiHouse design to date. This gives us a lot more flexibility in the type of space we can craft, and will be better for such uses as public buildings and schools, which require larger internal spaces. The second exciting thing on the structural side is that we have designed a new floor plate waffle system that utilises a two-way box beam combined with a structural plywood skin top and bottom. This will move some of the functions of the foundations up into the floor of the building, meaning the entire structure can be supported on just two ‘rails’ (bearers), whereas previously we had planned for three. The building will be cantilevered by about a quarter of its width at either end, which will give the appearance that the building is hovering above the ground. This advance promises to reduce the overall foundation requirements, which in turn reduces the time on site, ground works and cost of the foundations. We hope that an additional feature, of particular interest to Christchurch people, is that the very strong yet flexible floor allows us to reduce the individual load-bearing requirement for each pile. Because of its toughness, if we get any subsequent differential settling, it will automatically try to distribute the remaining mass to the piles that haven't settled – basically, it will try to self-level. In traditional construction, you try at any cost to stop the building settling differentially, because it is likely to start falling apart. Whereas, our design is quite happy to even live without some support points for a period of time if needed until relevelling can be carried out. We still have to make sure this all stacks up in reality, but our consultant engineers at this point are happy to support further exploring our vision for that. Another exciting development is that we have begun destructive structural testing. 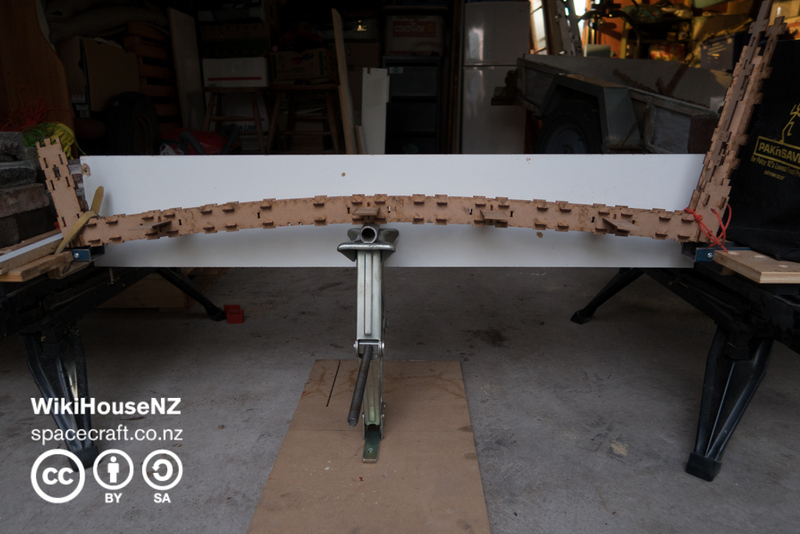 One aspect of this is testing at scale, and for the first time we have been cutting new models at quarter and one-third scale in plywood. Previously, our scale models had always been at 1/6 scale cut from medium density fibreboard (MDF). While the models have given us very useful feedback, MDF is a completely different material from the structural grade plywood that will comprise the finished building. We have now completed cutting several portals (frame units) at quarter scale in plywood. Using a test rig designed and built by Martin and Rachel, we have begun testing these portals. The results have shown they have failed at higher load levels than anticipated, which is excellent news. A full-size test rig will require up to 10 tonnes of concrete which has been kindly donated by Mark Lanyon of Lanyon & Lecompte Construction and formed into 20 half tonne blocks. Essentially, the rig will comprise two big stacks of concrete blocks, some steel beams, and a 10-tonne jack. Framing elements are anchored by the concrete, and then stressed in the middle until they break, which will tell us the load they can bear and the weakest point of the structure. We are always on the lookout for like-minded organisations that share our values to partner with in development and the transition to production. 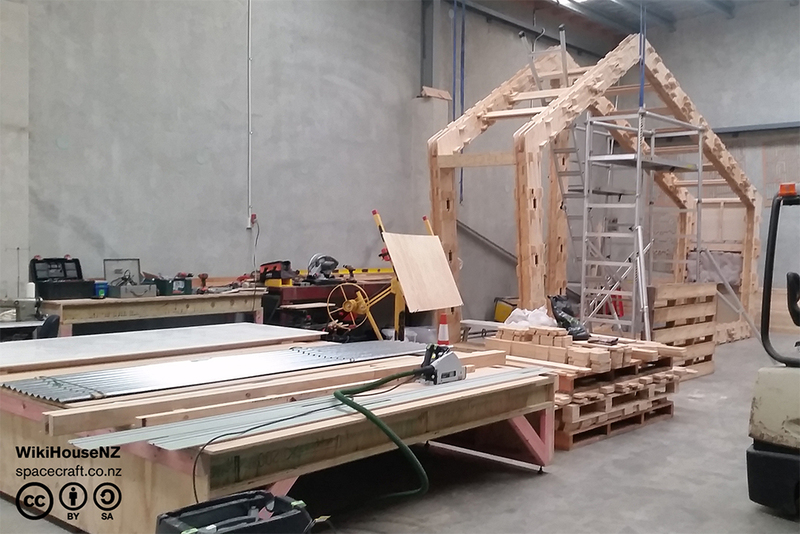 Please contact wikihouse@spacecraft.co.nz if your business or organisation would like to talk about working alongside the leading team in this growing global movement. 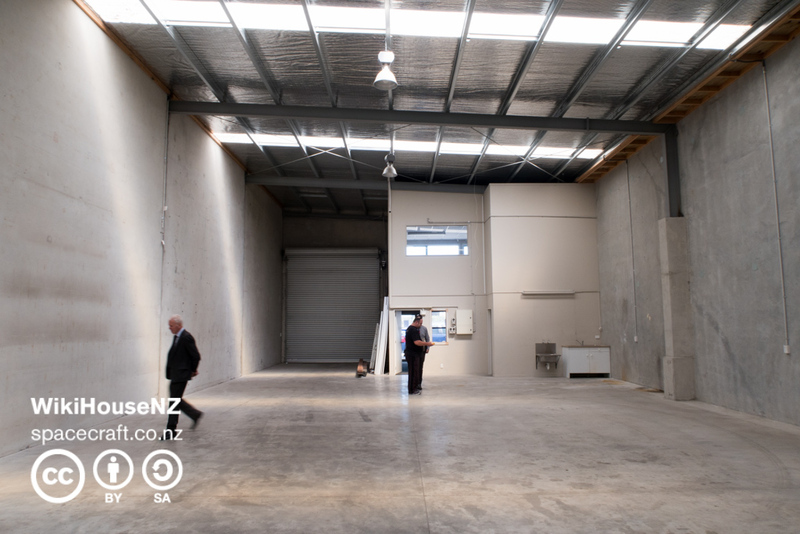 Now we have portions of the building assembled, we are inviting potential partners, early adopters and suppliers to view the development progress inside the factory. Our eventual aim is to subsequently put a demonstration house on the ground at a Christchurch location yet to be finalised.